It's a journey that started thirteen years ago with the release of The Lord of the Rings: The Fellowship of the Ring. Now, the story of Bilbo Baggins, Gandalf, and Middle Earth comes to an epic conclusion with The Hobbit: The Battle of the Five Armies. The final film in The Hobbit saga is scheduled for release 16 December, but those uber-fans can see Battle of the Five Armies twenty-four hours early on 15 December. Warner Bros. Pictures, in conjunction with New Line Cinema and Metro-Goldwyn-Mayer Pictures (MGM), is treating über-fans to a movie marathon. 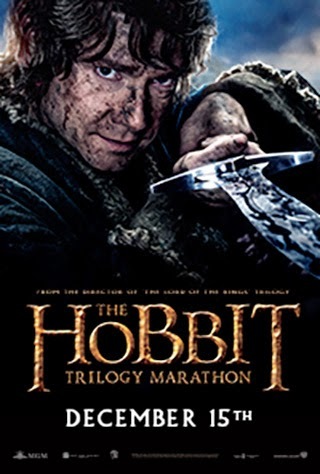 Tickets are now on sale for The Hobbit movie marathon, that starts at 1PM with The Hobbit: An Unexpected Journey. For more details or to see if a theater near you is hosting The Hobbit movie marathon, click here.